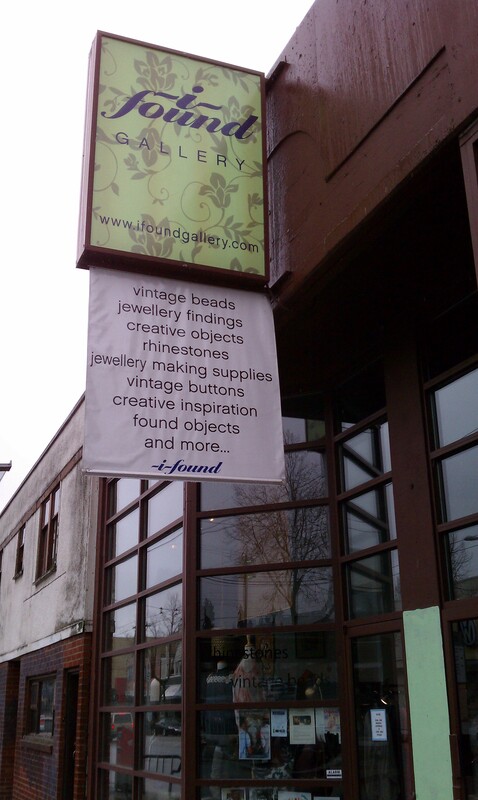 …at “i found gallery” was one of the best interactive shopping experiences of vancouver. inspired by some of the often expensive vintage jewelry i saw while exploring vancouver’s retail landscape, i wanted to take a chance at creating my own one of a kind heirloom piece and “i found gallery” delivered on everything i needed. 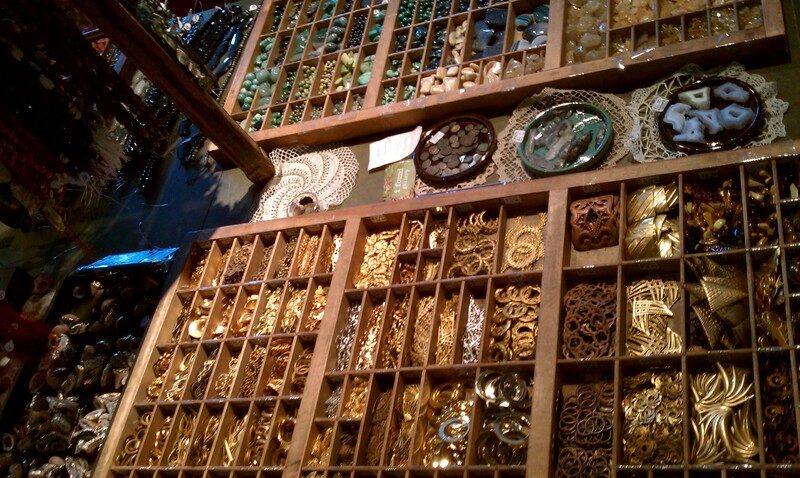 located on the bohemian flavored southern end of the main street shopping district, “i found gallery” is a beautiful open space full of glass cases housing the largest collection of vintage jewelry findings i’ve seen thus far. connectors, pendants, chains, clasps, rhinestones, buttons, etc. it’s all there for you to browse through for your own diy projects. i have to admit, initially i found it daunting having no clue as to what i wanted to make and how i was going to go about getting started. after some reassurance, i was handed a little shadow box for loading up my goodies and off i went. i spent at least an hour gathering all of my bits and baubles planning a strategy for the necklace i was to make, most of the effort involving the actually engineering and balance of the piece. demmy gilmour (one of the founding partners) and her assistant, jen, were very patient and generous in their advice which made the overall experience less intimidating and more like hanging out with friends. once i’d gathered all of my goods, i was welcome to take my place at the large wooden worktable and use their tools and at times, their know how to finesse my necklace into being. i’d chosen vintage brass chains, clip on earrings, a small woman’s watch, a little locket and other various charms which would have meaning for me. 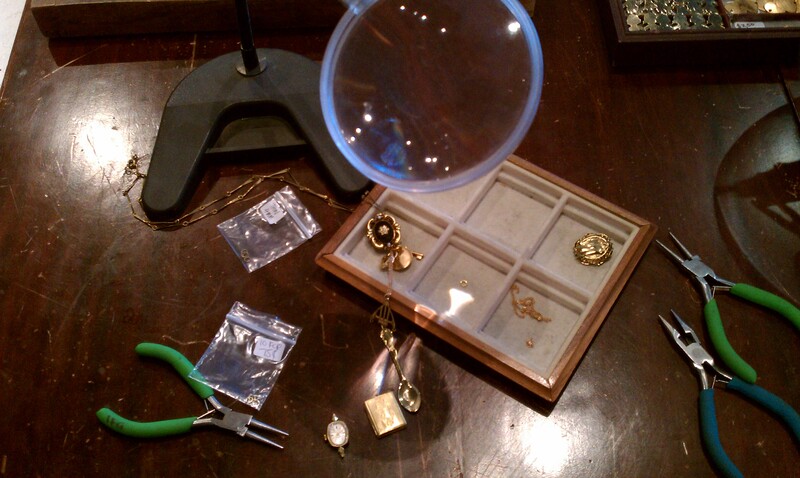 nice relaxing music played in the background as i worked with my magnifying glass and jump rings while gradually i forgot where i was and took pleasure in feeling the weight of the tools in my hand. every once in a while, demmy or jen would pop over to check in on my progress the interruptions being welcome and fairly unobtrusive. my thrill was in adding the final touches of the faux pearls and minute sparrow to the brass chain, accents to add visual interest keeping the eye moving. the final result is shown below with my zodiac charm necklace (top) and silk goddess dress. 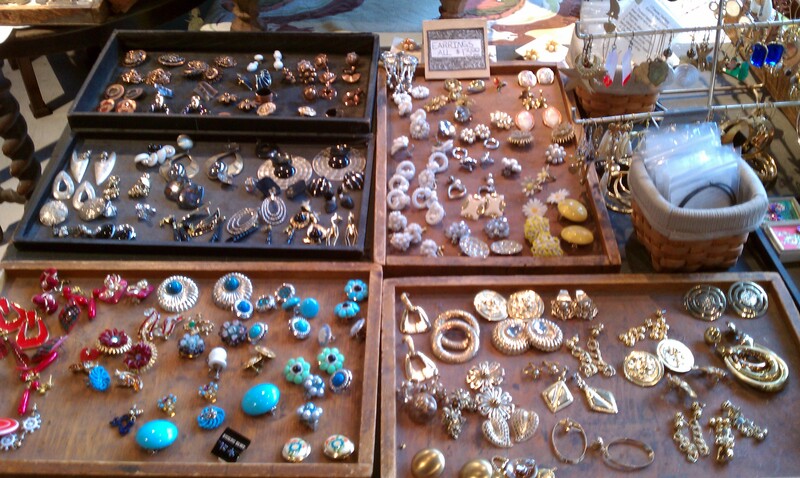 the focal point in the top layer of charms is one of the vintage clip on earrings. the layer below, has a lyre shaped connector with the vintage watch, tiny brass spoon and locket. i combined two vintage brass chains to balance the necklace and to prevent the charm clusters from twisting. because the brass chain is made from links that twist, it was necessary to hang the second chain in the opposite direction to counteract the torque of the first. voila, stable pendants! at only $55 give or take a dollar or two, my efforts were far less expensive than some of the $300 necklaces i saw not to mention the satisfaction of having done it myself. the other interesting aspect of all of this, is the small, tightly curated collection of vintage clothing in the center of the shop. if you’ve not got a silk goddess dress of your own to pair your work with, you’re bound to find a frock or blouse there among the goods. i found “i found gallery” the ideal place to let loose your creativity and rediscover your individuality. while there, make sure you say hello to demmy, a transplant from perth, trying to make peace with the wet wonderland of vancouver!